The March program page has all you need to know about events between now and the end of the month. 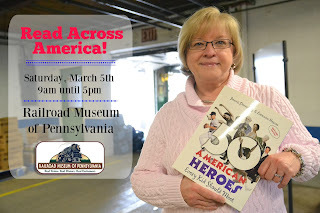 The Railroad Museum of PA will be open Sunday (3/27), but I believe all other Trails of History sites will be closed for Easter (someone please correct me if I'm wrong and I'll update this info). UPDATE: The Pennsylvania Military Museum is open this Sunday - my apologies for the omission. Earlier this month, LancasterOnline included Ephrata Cloister in its list of "things you must see and do in Lancaster County." 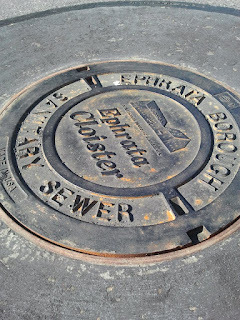 Folks at the site are working with the Historical Society of the Cocalico Valley and other local organizations to help mark the 125th anniversary of the borough of Ephrata, which grew from its early settlement by Conrad Beissel and followers (1732) to a municipality of more than 13,000 people. 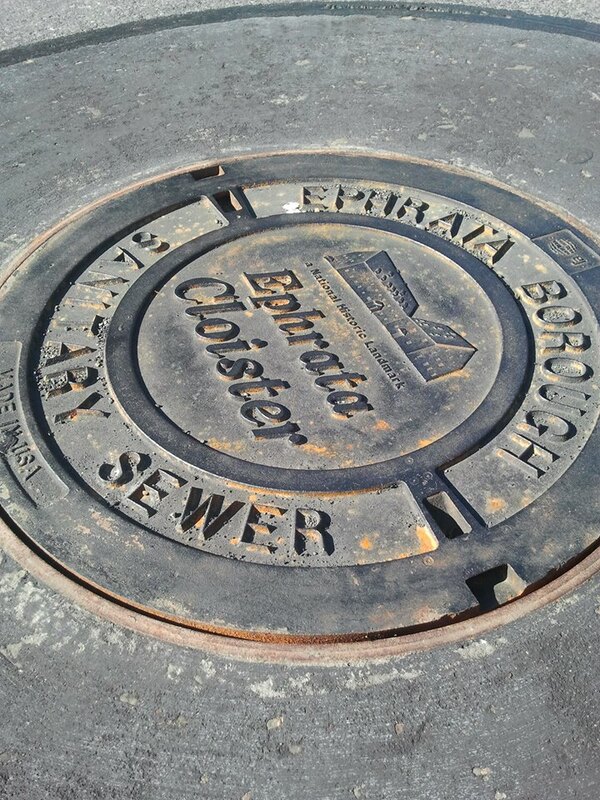 The borough takes pride in its roots, featuring buildings from the early community on its website and even their sewer covers. Hey, free advertising is free advertising. The PHMC's Commissioners, at their meeting on March 9, approved the latest round of historical markers, which cover a broad range of activities, personalities, and geographic locations. You can read more about this year's list on the State Historic Preservation Office (SHPO) blog. You'll find information on the historical marker program and how to submit a nomination on the PHMC website. March 28 through April 3 is #MuseumWeek 2016, where hundreds (thousands?) of museums world-wide will be on Twitter to share their institutions with the public. The PHMC and several Trails of History sites participated last year and the public is invited to share content as well. Follow @PHMC or your favorite Trails of History site (and many others as well) to see what they're posting. There is a different theme for each day. Sean Adkins collected the PHMC-related tweets for MuseumWeek 2015 on Storify if you want to get a sense of the broad range of images people shared (some of the hashtags from 2015 are repeating in 2016 but there are also new ones). Please join in! Be sure to check the March program page for info on events coming up this weekend and beyond. Lots of people braved a rainy Sunday afternoon (not to mention that lost hour of sleep) to visit sites on the PHMC's Trails of History on Charter Day. Yes, I know free admission always draws a crowd, but you had to be somewhat committed to a history experience as well. As always, there were photos on social media to document the day. Philadelphia-based travel blogger Traveling Armchair (@TravlinArmchair) tweeted photos from her Charter Day visit to Pennsbury Manor, noting that although she's lived in PA all her life, it was her first visit to Pennsbury. She also did a follow-up tweet with a beautiful photo of freshly baked bread (I, like Oprah, love bread) and a fun fact about the bake oven at Pennsbury. Ephrata Cloister posted photos of some of the folks who provided a warm welcome for visitors and helped them learn about life at the site. In addition to Pennsylvania's birthday, they were also celebrating the 325th birthday of Ephrata's founder, Conrad Beissel. Ryan Royce Patches posted photos of Charter Day activities at Conrad Weiser Homestead, which the site shared on their Facebook page. Charter Day is Weiser's largest living history event of the season, although certainly not the only one. You can check out the 2016 calendar of events on their website. UPDATE 11AM 3/18/16-The Daily Antiquarian posted images from Conrad Weiser Homestead and Cornwall Iron Furnace on Charter Day. Still on the theme of photography, Eckley Miners' Village has announced the winner of their 2016 Winter Wonderland Photo Contest. This winter's weird El Nino-driven weather pattern, where the Anthracite region got less snow than usual, affected the contest, but did not leave them bereft of entries. Congratulations to Timothy Price for his snowy photo of the Eckley breaker, built for the production of the film The Molly Maguires (1970). And since we've pivoted to films, the Pennsylvania Trails of History Facebook page shared a link via the Greater Erie Film Office about a new documentary production on the Battle of Lake Erie (1813). As reported on Erie.com, the production crew from Lou Reda Productions has been in town shooting locations and interviewing people for the documentary. In the article, executive producer Scott Reda says he fell in love with the story of the battle while spending a day at the Erie Maritime Museum. Walter Rybka, museum director and senior captain of U.S. Brig Niagara, was filmed for the production, providing a narration of the battle. The documentary is slated for television release in 2017. So Sunday is Charter Day, and we'll be celebrating Pennsylvania's birthday all along PHMC's Trails of History. A couple of sites will celebrate other birthdays as well - Dr. Joseph Priestley and Ephrata founder Conrad Beissel. Landis Valley Village & Farm Museum will debut their 2016 exhibit on weathervanes. The State Museum will have the original Charter of 1681 on display. Conrad Weiser Homestead will hold their largest living history event and kickoff their season. And those are just a few of the activities planned - be sure to check out the list of open sites and the March program listings for details. Be sure all your clocks are set ahead one hour early Sunday morning for Daylight Saving Time or you might miss some of the fun! UPDATE: If you tweet about your Charter Day visit please include #PaCharter2016 and tweet to @PHMC. Jim Cheney, who has written about a number of Trails of History sites on his blog, UncoveringPA.com, recently described his visit to Ephrata Cloister. Appropriately for Charter Day, Cheney concludes his post (after noting that he quite enjoyed his visit) with: "It offers a peek into one of colonial America’s most unusual religious societies and gives a great perspective on how the religious freedom instilled into Pennsylvania by William Penn shaped the colony in the 18th century and beyond." A Los Angeles Times article about the west coast debut of Julia Wolfe's Pulitzer-Prize-winning choral work, Anthracite Fields, noted that her research included folks at the PA Anthracite Heritage Museum in Scranton (read more about it in a previous Trailheads post). Last week, VacationIdea.com had a post listing the "25 Best Things to See & Do in Erie, PA." Near the top was our very own Erie Maritime Museum - the article noted the museum's exhibits of historical artifacts, its interactives, the Lawrence ship-section exhibit (which shows the effects of cannon-fire on a wooden sailing ship), and the GE steam-powered generator. Visitors also know that the museum is the homeport of the US Brig Niagara. Earlier this winter, DC-based blogger Erin Gifford (kidventurous.com) and her four kids had some unexpected school vacation time due to snow. They headed north to PA to avoid cabin fever. 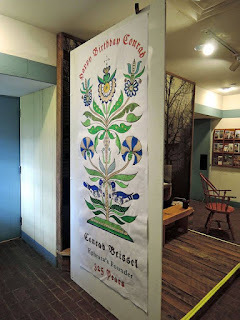 Their visit to Lancaster County (recounted in a post called "Exploring with Kids: 36 Hours in Lancaster, PA") included stops at the Railroad Museum of PA and Landis Valley Village and Farm Museum. And okay, this last one isn't specific to the PHMC or the Trails of History, but I'm sharing it anyway because. On the blog for the Association of Living History, Farm and Agricultural Museums (ALHFAM), Derrick Birdsall recently wrote a post called "The Walking Dead and ALHFAM?" that explores an interesting point. (I don't follow the show so I don't know if this constitutes a spoiler or not - if that matters to you then stop reading now.) Birdsall notes that a location called the Hilltop that serves as a refuge from the zombie apocalypse was chosen because it had been a living history site, preserving the knowledge of how to survive without the modern amenities. He wonders if any living history sites might be able to take advantage of that fact in their marketing. Thoughts? Finally, since we're talking about marketing and promotion and all that, the PA Tourism Office this week unveiled a new brand for Pennsylvania. They produced a video to launch the idea and I thought you might like to see it, if you haven't already. I put the March program page up earlier this week (which I guess is fitting, since it became March earlier this week). You may also want to check out the list of sites that will be open on Sunday, March 13, for Charter Day. Photographer Jennifer MacNeill recently posted an album to her Facebook page with photos she took at Eckley Miners' Village. You may have seen some of her photos of Landis Valley Village and Farm Museum on Facebook or seen her work represented in the annual Art of State exhibition at the State Museum. Thanks for sharing these, Jennifer. Uncovering PA's recent post, "10 Great Things to Do in Pennsylvania in March," includes PHMC's annual Charter Day celebration. Thanks, Jim Cheney, for including us! The March/April 2016 issue of Pennsylvania Magazine includes a beautifully illustrated article about Old Economy Village by Paulette Dininny. This is not to be confused with another lovely article about Old Economy by curator Sarah Buffington in the winter 2016 issue of PHMC's Pennsylvania Heritage. Both articles are a great way to get caught up on the history while waiting for the centennial activities at the site to kick into high gear.